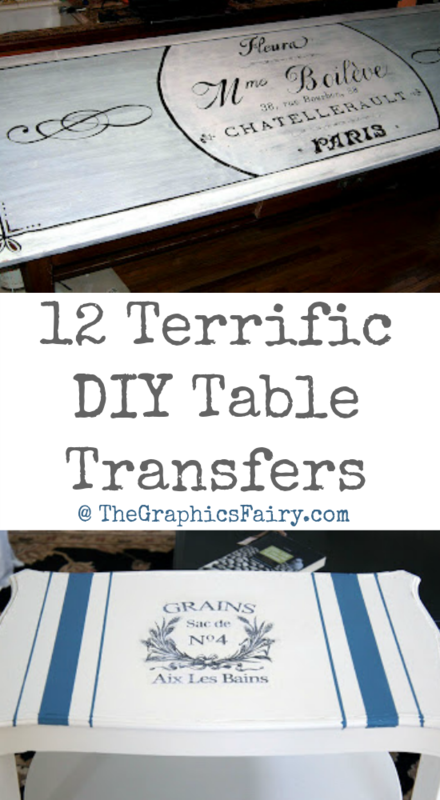 Today I’ve rounded up 12 Terrific DIY Table Transfers! All of these wonderful Painted Furniture projects were created using Vintage Graphics from my site. Some were created by my contributors and some were submitted by readers! I had so much fun putting this collection together, I hope these projects and DIY’s will help inspire you! The first project is below. We’re starting off this collection of fabulous Painted Transfer Tables with a bang!! Kat from Touch The Wood rescued some really dark nesting tables and gave them a new look, with Annie Sloan Chalk Paint in Old White and Paris Grey, which are 2 of my favorite ASCP colors…aren’t they fabulous?!! I think they look perfect with my French Wine Printable from HERE. I can hardly wait to share the 11 other gorgeous furniture projects with you in this collection, click on the hand to see the next one! 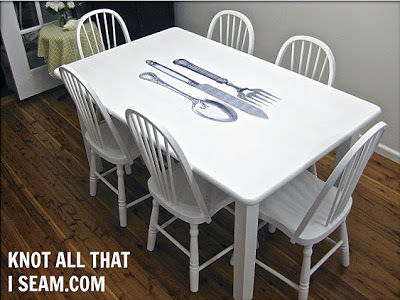 I adore this fun Cutlery Graphic Dining Table by Julie from Restyle Relove! 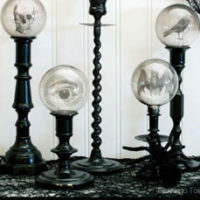 So clever and a great look for a Kitchen or Dining room! She used the Fork, Knife and Spoon image from HERE, for her DIY painted white Farm Table! 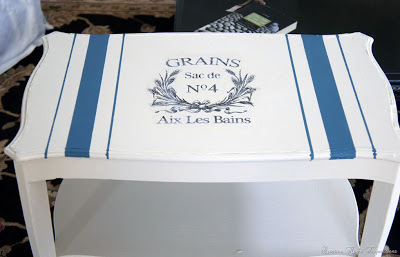 Kathy from Creative Home Expressions shared this fantastic little table, inspired by a French Grain Sack…I love the blue! This one is a long time favorite of mine. She used the Grain Sack Printable from HERE. Sarah K. Creative painted this lovely round table and gave it new life…I just love the way it turned out!!! 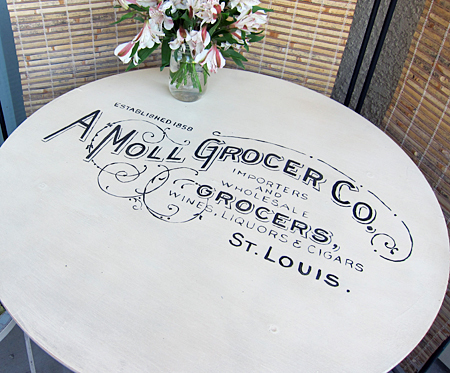 The Transfer printable that she chose was the American Grocer Sign from HERE. Such a great Country look, perfect for a Farmhouse style Kitchen! I still love this one…Korrie from Red Hen Home shared this absolutely amazing Carte Postale Coffee Table a couple of years ago, and I have always admired it! 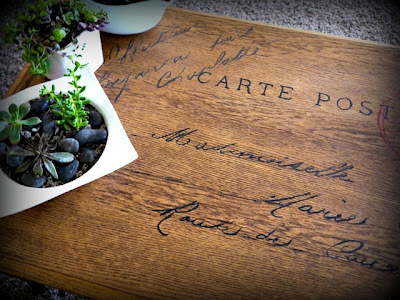 I love the contrast of the stained wood with the French Script! She used the back of a French Postcard Image HERE. Patti from Shabby Pink Stamper shared this amazing table that she painted and transferred some of my graphics onto, including the French Ephemera Frame and the Princess Crown Image…it is so pretty! Here is another wonderful transformation from Korrie at Red Hen Home…can you believe how great this vintage sewing table looks?! The Vintage Clothing Ad Label was the perfect choice for this piece! 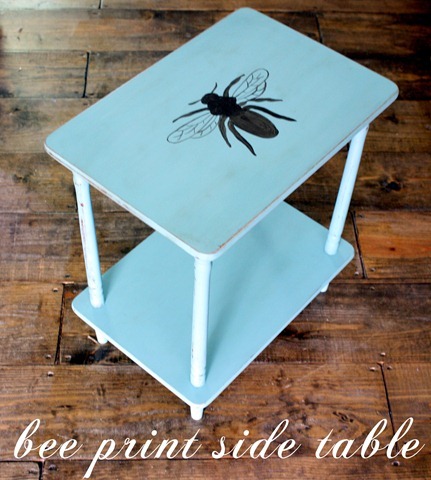 This fabulous Bee Print Side Table was painted by my good friend Gina from The Shabby Creek Cottage…I love the color! She used Annie Sloan Chalk Paint in Provence for this lovely painted furniture project and a fool proof Transfer Method that anyone can do! 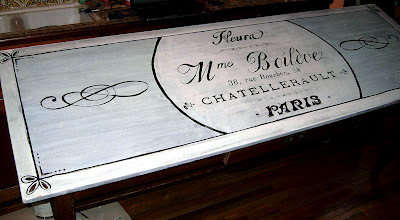 This elegant French Table was hand painted by Professional Florist Brandy Spears…I think it is gorgeous! She used the French Flower Seller Printable from HERE. Great choice! Love the two tone blue and white paint combo and all the special added details! 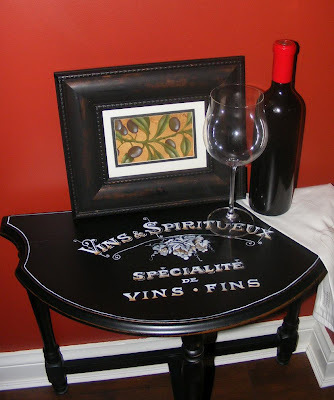 Tracy Moreau submitted this awesome Hand Painted Wine Table…she has some amazing painting tutorials that you should definitely check out on her site! She also used the French Wine Typography Printable. I think the black paint with the white writing is very striking! 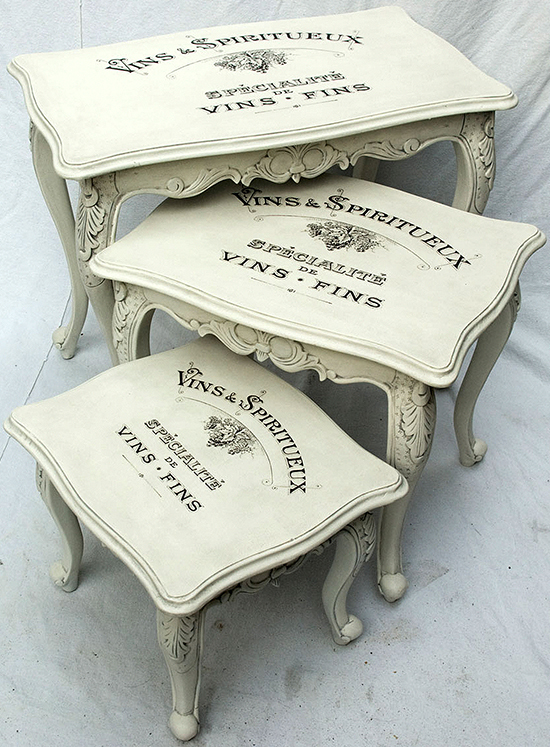 Here is another set of fabulous painted nesting tables! My sweet friend Jessica, from Dear Emmeline shared these …she actually painted these as a wedding gift! How wonderful!!! She used the Wedding Typography Images from HERE. This fab rustic table was shared by Nik at NikAntik, and has been a long time favorite of mine! So lovely for on a porch or patio! 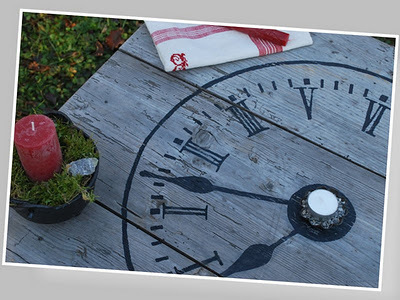 She cleverly used the French Clock Face from HERE for this wonderful Garden Style project! 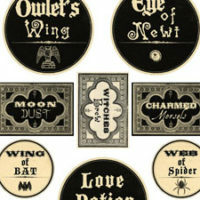 « Romantic Paris Perfume Label – Gorgeous! 🙂 Those tables were so much fun to make! thanks for the images! Thanks Jessica! 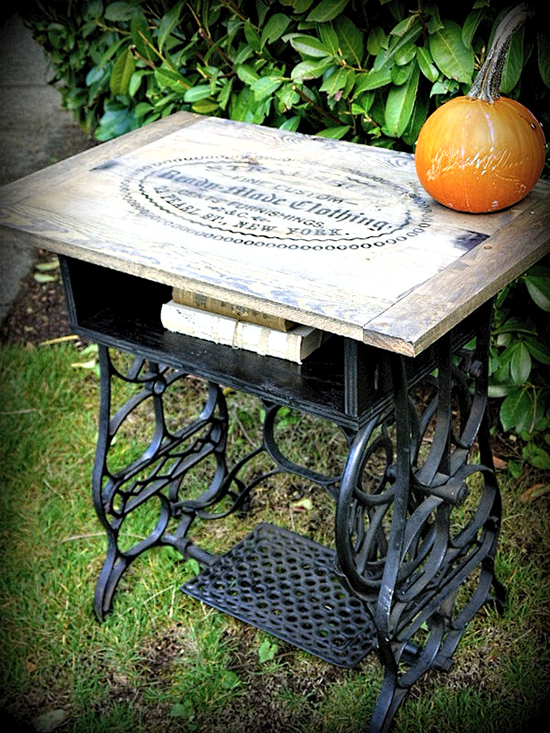 I’ve always loved those little tables you did! You’re welcome Kathy!! Such a gorgeous table! WOW! Each table is wonderful. Thanks Karen. P.S. How do they get their designs enlarged? I have just branched-out to wooden boxes, which is the closest I’ve come to furniture. I cant wait to visit the next 11 projects. Thank you! Wow! Karen, thank you so………..much for consolidating these great projects into one post! Lots of inspiration indeed and as usual, I get introduced to more and more talented artists/crafters/hobbyists out there because of you and your gorgeous images! 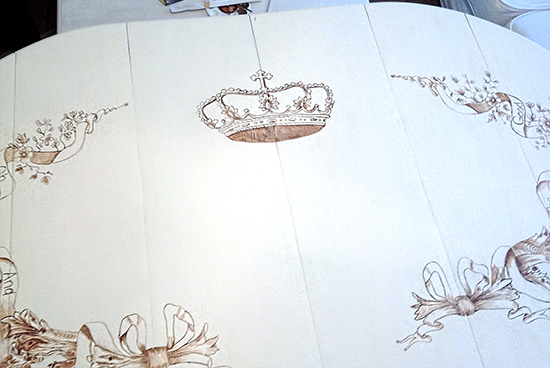 This table transfers are absolutely beautiful! They add such a vintage feeling to the tables. I am wondering about transfers you can use on glass. I have a pane of glass I would like to make look like stained glass without all the work (or expense). Hi I love your printable a. Just one question how do you put them on furniture? Mod podge? Doesn’t that look funny on the top of the table? Hi Deb, If you click on the “Transfer Methods” button at the top of my blog, there are all sorts of methods there for you to choose from. I hope that helps! Hi there! 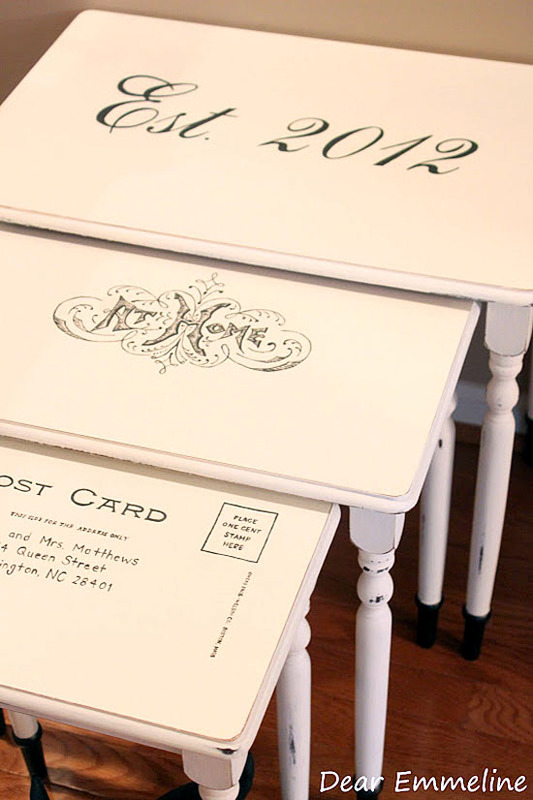 I love the 3-set tables wich are painted in Annie Sloan’s chalk paint Old white and Paris grey!! But I wonder HOW they are painted? I mean did she mic the colors or did she panted one color and after that the other color?? If so: wich color shall I start with to get this lovely effect? I hope You understand how I mean!? It looks like she painted the legs in the Paris Grey and the tops in the Old White. It is lovely, isn’t it?